This weekend David Beckham became champion with Paris Saint-Germain. It has been speculated that he will remain in the French club, but with two league games left of the season, 38-year-old announced that football career is over. – I am grateful that PSG enables me to continue, but I feel that now is the right time to finish my career, says Beckham. The magazine Café recently did an interview with David Beckham where he talked about his relationship with Zlatan Ibrahimovic. – I have always respected Zlatan as a player. Now I know him and he is a great person, a good friend. Above all, he is a winner. To become a top player, one of the best strikers in the world, you have to work hard. If Zlatan does not win the small games at practicehe gets a little angry and it says something about him. With his talent and passion, it is an honor to play at his side, says Beckham to the magazine. – We have eaten a few dinners together. In a team, it happens of course you go out and eat together. It seems like even though David Beckham and Zlatan Ibrahimovic had the famous Bieber incident they still remain friends. During his time at LA Galaxy Beckham was playing with Christian “Chippen” Wilhelmsson, who has a lower back tattoo that is similar to David Beckhams. – It is very similar, not exactly the same, but similar. He concealed the fact that he had it for me during the first few weeks, but I managed to get a glimpse of it in the end. He is an amazing person. Just like Zlatan, he is a very down to earth and friendly guy, who had a large part of our success last season. It would be great to see him again sometime. Beckham says he has no plans to begin a coaching career. – Manager? I’ve never been interested in it. In that case, I like more to coach children. But you never know, says David Beckham. With the money David Beckham has earned during his career we are sure he would be fine with just quiting football. Just yesterday it was announced in Sports Illustrated that David Beckham makes the most of all athletes outside USA. This entry was posted in Interviews, Rumors and tagged Beckham and Zlatan, Beckham retire, Chippen, Christian Wilhelmsson, David Beckham, Zlatan and Beckham on May 17, 2013 by Johan Bengtsson. On May 19th we will find out who is crowned player of the year in French football. Earlier this week the nominations for player of the year were announced. It was then not surprisingly league leader Paris Saint-Germain who dominated the nominations. 27 league goals and one of the key players at Paris Saint-Germain Zlatan Ibrahimovic has been the main contributors to the League title win (which is not yet secured). Zlatan will also win the top scorer in the league this year. But coach Carlo Ancelotti does not consider Zlatan Ibrahimovic as player of the year in Ligue 1 but instead chooses Blaise Matuidi. Only in the category of this year’s best player PSG has three of the four representatives. The three nominees are striker Zlatan Ibrahimovic, center-back Thiago Silva, midfielder Blaise Matuidi and Saint-Etienne’s goal scorer Pierre-Emerick Aubameyang. One of them will take home the award as player of the year in the French league. Ahead of Sunday’s meeting with Lyon, where a PSG win would secure the league title, manager Carlo Ancelotti was asked who he thinks will win the prize. – Really Difficult. A player who is much better compared to last season, most of all, is Blaise Matuidi, Ancelotti said. 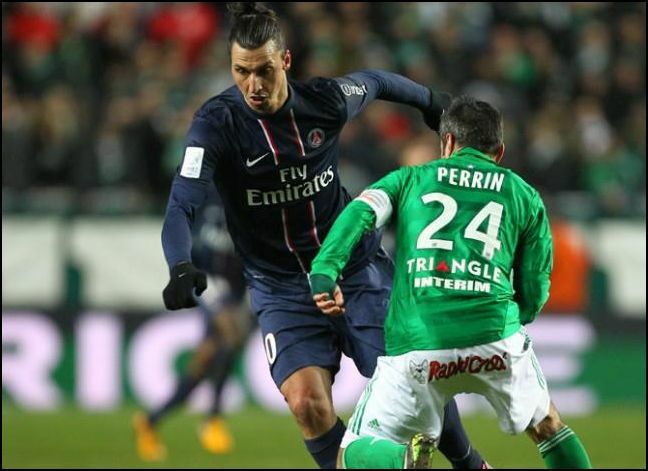 The 26 year old midfielder came to PSG in 2011 from Saint-Étienne and is now also an important cog in the French national team. Ancelotti himself may also be praised when Italian is nominated for this year’s coach. This entry was posted in Interviews, Rumors on May 12, 2013 by Johan Bengtsson. Paris Saint-Germain have to wait to celebrate league gold in the French league. 1-1 against Valenciennes now makes PSG seven points ahead of second placed Marseille, with three rounds left to play. But after yesterday’s game it was all about after the game referee Alexandre Castro’s performance. He showed Thiago Silva the red card, after Silva touched the referee in relation to a free kick. After the match PSG boss Leonardo was seen tackling the referee. – What has happened is unacceptable and there is absolutely no logic in what he does. It’s a good match, but it will be a red card and seven yellow, says Leonardo. – Not much to say. There is a person who has a yellow sweater that destroys the whole match. All were probably upset, it’s not acceptable, says Ibrahimovic. – When players get a penalty, they may go to a commission. We should send the judge to this Commission so he can explain himself. You also got a yellow for talking, what did you say to the judge? – No, he put his finger to me to be quiet. Then I asked, “Why, why?” And then he gives me a yellow card. What do you think of the title race? – Three points and then it is settled. Now we take one game at a time and also take it one week at a time. What ever happend at Valenciennes happened. We can not do anything about it now. Despite the 1-1 draw against Valenciennes Zlatan feel calm that PSG wins the league. The distance to chasing Marseille is six points with three rounds remaining. Next, waits Lyon away from home for Paris. – I have the confidence and the whole team as well. What is it that made you have been so good this season? – It’s been up and down this year. We have had some setbacks, but we have done well. This is the first year we’ve played together, at least for me, and it has not been easy. – There are many things that have happened, it’s not an easy league. Zlatan Ibrahimovic’s future at PSG is still uncertain, and even though he has two years left on his contract with the French club rumors about a move to Juventus or Napoli have appeared the last weeks. Juventus and the team’s coach Antonio Conte still want Zlatan Ibrahimovic, as reported in the Italian media. Zlatan Ibrahimovic is however not saying much, when it comes to interest from the Italian big club, who yesterday celebrated that they have secured the Scudetto. This entry was posted in Interviews on May 7, 2013 by Johan Bengtsson. There will be no Juventus move for Zlatan Ibrahimovic, at least if you believe the Paris Saint Germain coach Carlo Ancelotti. Carlo Ancelotti states that Zlatan Ibrahimovic will remain in Paris for another season. – There are many teams that would like to have Zlatan Ibrahimovic but it is PSG who are fortunate to have him playing here and he does a fine job, says Ancelotti to Sky Sport 24. – He will stay in PSG. The same applies Marco Verratti. The rumors of a move back to Juventus has grown bigger and bigger in recent weeks in which several leading figures in the club expressed a clear interest for referring back Zlatan Ibrahimovic to Juventus. After PSG’s 1-1 match against Valenciennes on Sunday Ibrahimovic refused to answer questions about the alleged relocation plans. He has not commented Ancelotti claims. This entry was posted in Interviews, Transfer Rumors on May 7, 2013 by Johan Bengtsson. After the game against Evian Zlatan Ibrahimovic refused to comment on his future. According to Italian Tuttosport Zlatan Ibrahimovic said something completely different to PSG’s leaders. – If we win the title I’m going on vacation. After that I am leaving rumors say Zlatan have informed PSG. According to the Tuttosport Zlatan has decided to leave France. The Swede should have announced his decision to PSG’s leader after the 1-0 victory against Evian on Sunday. – If we win the title I am going on vacation. At the end of the season I leave, should Zlatan have said according to Tuttosport. According to the newspaper Zlatan Ibrahimovic is tired of being in a league with only two or three games of a high sporting level every season. Zlatan has also not found his place in either the team or the city. It has also been rumored that his girlfriend and mother of his children Helena Seger prefers Italy over France. When 31-year-old met the press after just 1-0 victory against Evian, he did not comment on his future. When asked what he wants to say to all of PSG fans who are concerned that they may not see Zlatan in PAris next year Zlatan responded. – No, what the hell, ‘said Zlatan Ibrahimovic, left the interview zone and stepped away to PSG’s play bus. Sports director Leonardo has also denied that top scorer will be sold. – Ibrahimovic and Ezequiel Lavezzi will definitely stay here. It is 100 percent secure, said Leonardo recently to Sky Sport Italia. This entry was posted in Interviews, Transfer Rumors on May 2, 2013 by Johan Bengtsson. As we reported earlier this week Juventus has shown a big interested in Zlatan Ibrahimovic and it also seems like they want him fast. Now also Fabio Cannavaro, who was a former teammate with Zlatan Ibrahimovic at Juventus says he believes that Zlatan would get a nice comeback if he returns to Juve. This was said earlier today on an interview in “Undici” tonight, in Italia2. – Zlatan Ibrahimovic is a great player. He has developed and is now one of the very best. Zlatan is a player that is always better to have as a teammate than opponent, says Cannavaro in the interview. – He makes both goals and assists, and therefore he is a player who single-handedly make a difference. – If Ibra would return to Juve? I did, after all, in 2009, and I was well treated, says Cannavaro. 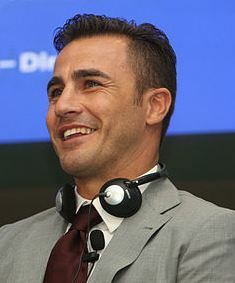 Fabio Cannavaro was born in Naples and began his career in Napoli and loves his home town and former club. And Fabio Cannavaro thinks Zlatan Ibrahimovic would fit nicely there too. – I see him as just right also in Naples. When we played there, he was very taken by the atmosphere at the San Paolo. Cannavaro also reveals that he gave Zlatan chance to experience Naples at close range – in a different way. – When we were there with Juve on away game I took him on a tour around in all lanes and Zlatan loved it! So both Juventus and Napoli are still possible clubs for Zlatan Ibrahimovic if he would decide to leave PSG in this summers transfer window. According to the interview with Cannavaro it does not seem like there is anything new in the recent rumors and we just have to continue to wait for more information. Circus Zlatan continues yet another day. This entry was posted in Interviews, Transfer Rumors on April 30, 2013 by Johan Bengtsson.